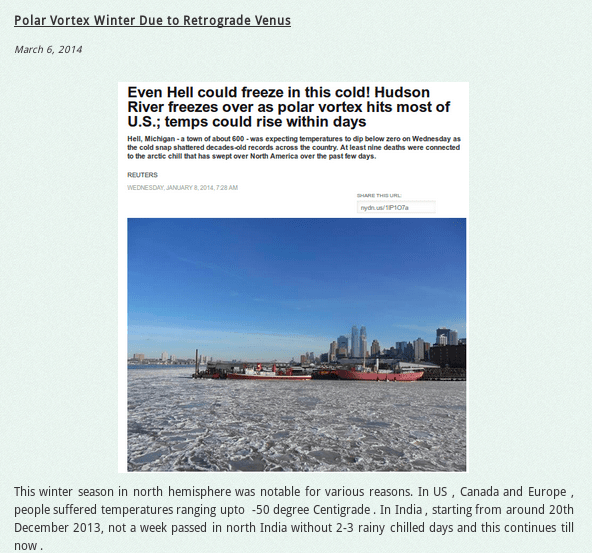 In March 2014 , I had written an article on polar vortex phenomenon where I had discussed the retrograde Venus staying in Capricorn sign for long period causing extreme weather . As an astrologer, I have also been an avid observer of weather related phenomena. In ancient classics , not much literature is available on astro-meteorology . Acharya Varaahmihir did some research into this but it was north-central India-centric and further astrological texts are also mostly north India centric . But our modern world has become truly global and we can get weather data from all over the world and co-relate it with planetary movement. Before , I come to my main issue , I would like to brief the readers about basic astro-meteorology as per Acharya Varaahmihir. Of all 9 planets Indian astrology uses , Sun has a fixed motion of about one degree everyday so that it completes 360 degrees in a year, which is basically Earth’s revolution around Sun. Therefore , Sun is the reference of weather related researches in astrology. In the middle of every calendar month , Sun enters next zodiac sign and process begins on 14 April with entry into Aries. After 9 months , every year on 14th January , it enters Makar ( Capricorn , 10th rashi from Aries ) and it is celebrated as Makar Sankranti. Indian astrology divides Rashis into 4 nature elements : fiery ( Aries , Leo, Sagittarius ) , watery ( Cancer, Scorpio, Pisces ) ,airy ( Gemini, Libra , Aquarius ) and Earthy ( Taurus , Virgo, Capricorn). Specific to most of India , summer season happens during April to June and Sun is in fiery Aries sign from 14th April to 15 May , so Aries is taken the basis for calculating the intensity and duration of summer season. Similarly , rainy season is from July to September and Sun remain in watery sign Cancer from mid July to mid August ,so Cancer sign is taken for calculating Rain intensity and duration. For winters , Capricorn sign is taken as basis for calculating winter’s intensity as it is earthy sign with some tinge for moisture (fog). In my observation , most of north hemisphere follows summer and winter on above pattern with monsoon rains specific to India. There are two inner planets close to Sun : Mercury and Venus and these play regular role in weather’s variation. Both these planets cannot go more than one zodiac sign away from Sun and for this they keep on regulating their speeds like a pendulum, making them fast or slow or even reverse motion ( Vakri ) as seen from Earth. Therefore , while Sun is for fixed 30 days in Aries ( Summer ), Cancer ( Rains ) or Capricorn ( Winter) seasons , the stretching or compressing of seasons happen due to Mercury and Venus’s stay in these signs . Further , between Mercury and Venus , Venus is considered watery planet and it is known for special effects like shining , beauty so causing thundering and torrential rains etc. Venus retrogrades every 15 months, while Mercury can be retrograde 3-4 times in a year. This way , we can say that any weather has 3 components : fixed one by Sun , then Mercury and Venus coming up for special effects in the season. Rest of the planets visiting Aries ,Cancer , Capricorn also have some effects but they are casual visitors and hence they also add some effects like complete drought , excessive floods for short duration . This year Venus first entered Capricorn on 5 December 2013, while Mercury was far behind in Scorpio . 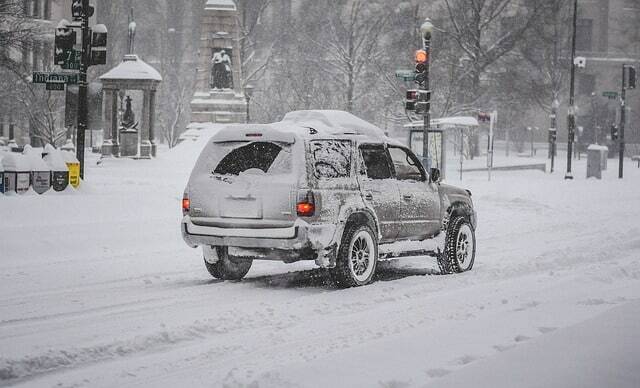 But Venus did not have normal stay this time in Capricorn , so from 5th to 22 December 2013, winter was just normal . On 21 December 2013 , Venus became retrograde in Capricorn at about 5 degrees and went back till 19 degrees in Sagittarius and again started forward journey to Capricorn on 1 Feb 2014. So this whole retrograde period from 22 December to 1 February was remarkable for North Hemisphere countries with unprecedented chilled winter with temperature touching -50 degree Centigrade and Southern Hemisphere countries like Australia witnessed opposite of that , above +45 degree . After 1 February , Venus is still in Capricorn till 31 March 2014 , so it is still showing extended winter in March also and Niagra Falls freezing in March as well. This way , the winter this year had special effects between 22 December to 1 Feb 2014 and then extended winter till March end. For northern and central India , this period had unprecedented rains in winter and 30-40 years rainfall records were broken , while there was less fog activity. The agricultural activities required less irrigation as rains happened almost every week. How Often it Happens ? Venus becomes retrograde in any sign every 15 months and then its stay in that sign becomes long and so the season extends and its effects are also quite special and difficult to ignore. Venus usually becomes Retrograde in winter ( Sagittarius / Capricorn ) almost every 7 years when a prolonged winter may be witnessed. This time, Saturn also added its glance on Retrograde Venus , adding difficulties for people and creating record rainfall and low temperatures in northern hemisphere. Venus in Capricorn is still there and minimum temperature records are still being broken in India in March, which is otherwise a warm month. Venus is incidentally planet for consumption items like clothes , electricity and food . So, such weather increases consumption of all these, though electricity spent in heaters was balanced by savings in electricity for irrigation in India while gas prices soared in Europe and North America. After 5 years , we again had a retrograde Venus just before start of winter season from 6 October to 16 November but in Libra sign . So, this time , Venus entry into Capricorn ( winter Zodiac sign) has been delayed to 24 February 2019 till 21st March 2019 . Effectively meaning that winter will extend till 21st March , having many chilled and rainy days in between. As happened in 2014 , this period till March will be having winter rains , hailstorms in plains and snowfall in hilly area . Prior to 24 February 2019 , Mercury has been doing the same as it entered Capricorn on 21st January 2019 and it is in this sign till 7th February and Ketu added extreme effect in the same sign.The news of polar vortex happened during this period only . This year , we did not have fog in northern India till 21st January and there were shiny days but once Mercury entered Capricorn fog and rains started . 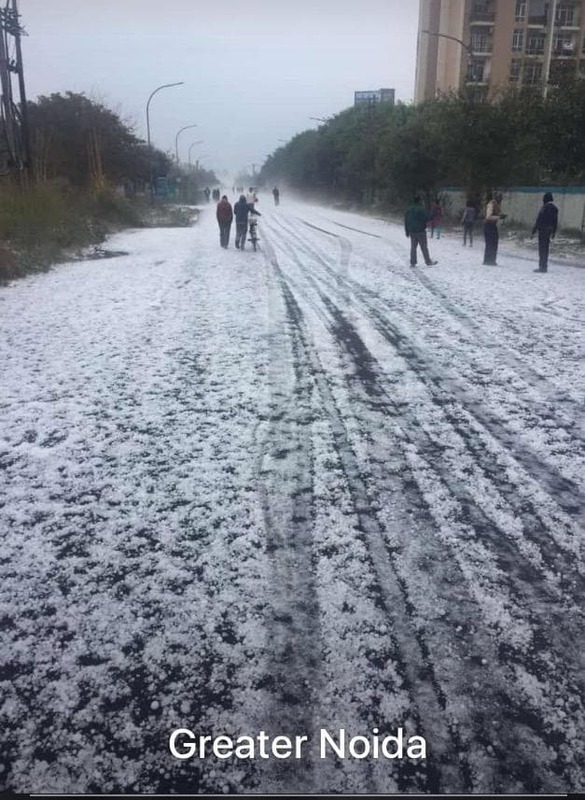 On 7th February , Greater Noida on outskirts of Delhi had the scenario of snowfall whereas it was actually caused by hailstorm. Extreme winter can be predicted if Mercury or Venus overstays in Capricorn due to retrogression of Mercury or Venus in October to February period .